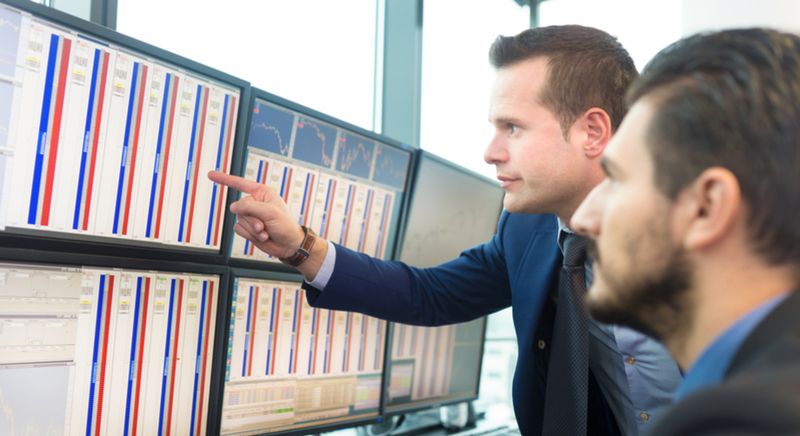 Breakout trading is one of the most popular ways to scalp the market the fast way. Trading has always been central to trader's life. The simple act of exchange has many facets when it boils down to trading the financial markets. Should all these facets be applied with the help of thorough and deep analysis, the trading path could lead to a successful trading journey. Trading is best performed with the help of various tools and indicators, but it can also be based on gut feeling, which is a losing path. Hence, it becomes crucial for the trader to base trades on authentic analysis to reap the optimum benefits of trading. This article delves deeper into the understanding of one such type of trading which has gained ample fame amongst traders – breakout trading. As breakout trading is primarily targeting smaller targets based on lower time frames, I need to highlight that it is more useful for day trading and scalping. Furthermore, trading breakouts requires prompt decision-making, and the majority of breakouts are practised using market orders. A trader must devote higher screening time to achieve the desired profit from this type of trading. Moreover, it contains higher risk and concentrates less on strict stop-losses; stop-loss levels in breakout trading are psychological levels. Let us first briefly dictate some of the salient features of breakout trading and then move towards the three different ways to trade breakouts! A breakout happens when prices exceed the previously determined Support or Resistance levels. Breakouts on longer time frames create more significant changes, while breakouts on shorter time frames have more impact on day trading. Long positions are triggered when prices move above resistance, while short positions are signalled when prices drop below a defined level of support. As the Support & Resistance levels witness a break, huge momentum spikes can be expected after breakouts, which might result in fast profits, given the fact that trades are entered in the right direction and are backed by a valid pre-emptive Support & Resistance level analysis. It is a general phenomenon that breakouts work during trending markets; however, the existence of stable technical levels can also help breakout trading. Breakouts result in the so-called "Stop Grabber" patterns, i.e., prices keep on taking momentum acceleration at predefined technical stops, but they don't deviate from the breakout direction. The result is usually a quick spike or bounce in the breakout direction. In the absence of a trend (i.e., a range-bound market), traders conduct breakout trading on lower time frames (M1 and M5), which is also helpful for scalpers. It is advisable not to trade breakouts on higher time frames (higher than H1) in the absence of a clear and well-defined trend because the risk/reward ratio (R:R) is poor. 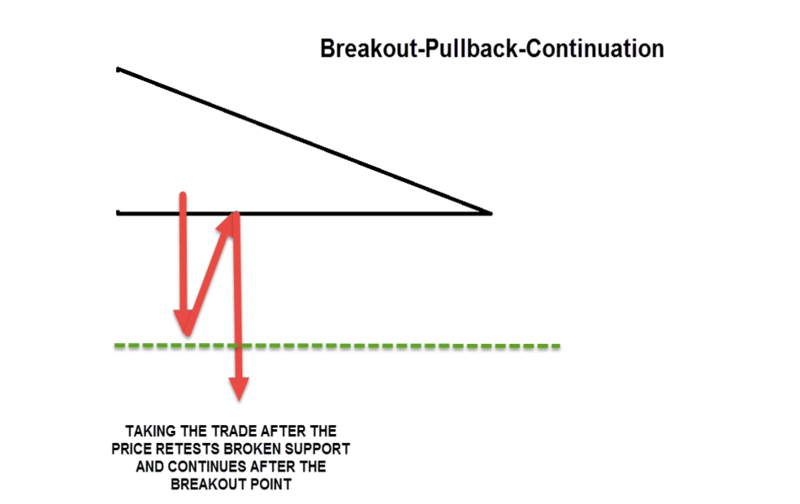 Breakouts also offer benefits to late trade entries as the establishment of new trends always follow the test of retracement levels first, and then it tends to run towards the breakout direction. Breakout trading offers more opportunities to short-term traders as the price witnesses increased momentum spike and collects stops above or below Support & Resistance levels. If practised efficiently, a single breakout trade is more than enough for a day. When the price breaks out suddenly after a triangle breakout, there is a chance to make instant pips if the trade goes our way. 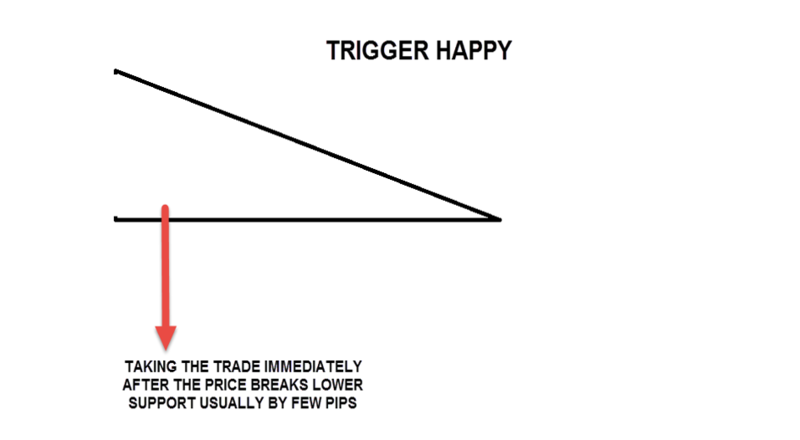 Pressing a Buy or a Sell button in the breakout direction without waiting for a confirmation or a retest is called a trigger-happy trade. This pattern usually follows a trigger-happy trade. 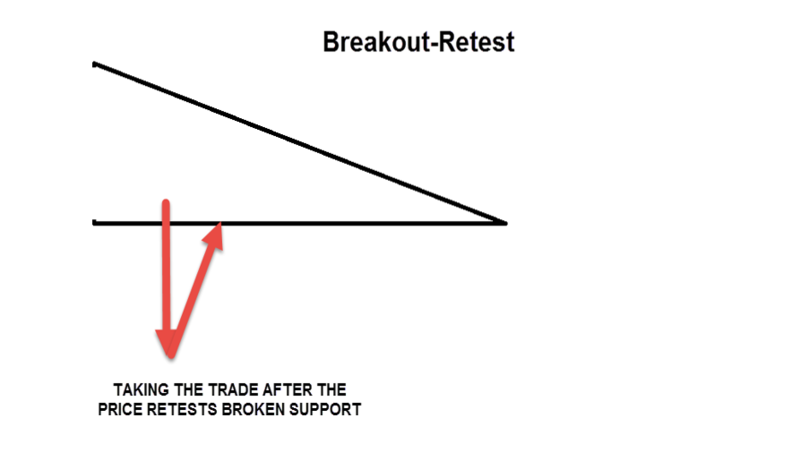 After a successful breakout or a trigger-happy trade, there is usually a follow up by a retest of the breakout level. After a successful retest, the price returns in the breakout direction. Enter the trade after the pullback just above/below point 1. Trading the BPC patterns works best if the Forex pair or an equity has a wide ATR range. London Open is considered to be the ideal time for trading breakouts, but New York Open is also good for reaping the benefits of breakout trading. This happens because trade orders have been accumulated during the Asian session, so we usually base our trades in Early London and London Open during which the market gains liquidity. If you have any questions, don't hesitate to ask us in the comment section below. We hope you will enjoy breakout trading to the maximum!